1.) 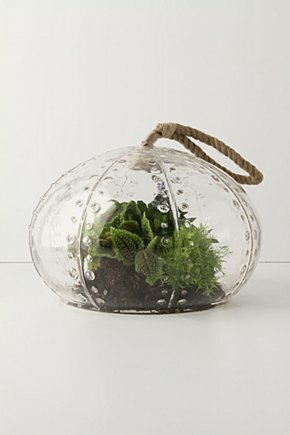 It was only a matter of time before Urban Outfitters jumped on the terrarium bandwagon by selling terraria, especially since Anthropologie has been riding that wave for a while- at least they have had terrarium decorations in their stores for a while. 2.) It also seems like UO/Anthro has a lot of urchin-shaped items in their stores. 3.) Hence, the above Urchin Terrarium, container available at Antrhopologie Online. Urban Outfitters is the parent company of Anthropologie AND Terrain...thus all the cross marketing. I'm sure it's working. Those containers are really cool. Pop Deluxe is here in Madison and their windows are totally adorned with them right now.